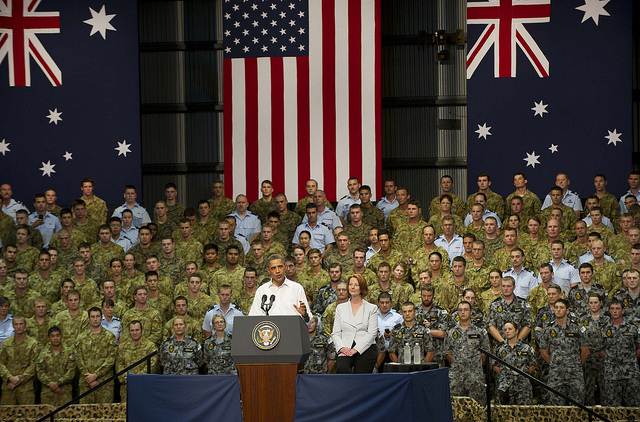 As we enter US President Barack Obama’s second term, one of the key strategic questions for Australia is what happens to America’s ‘pivot’ towards the Asia–Pacific. Announced in late 2011, it signalled a renewed US commitment to the region by strengthening and diversifying US military presence in the region. Later rebranded ‘rebalancing’ , it was largely a reaction to allies and partners worrying about a more assertive China and about the possibility of Washington becoming more isolationist in the face its looming economic crisis. Over the course of 2012, the US moved from rhetoric to incremental implementation. Apart from the announcement of plans to rotate US Marines through Darwin, Washington initiated similar discussions about greater rotational access with the Philippines. The Obama administration agreed to increase the number of forward deployed US Littoral Combat Ships (LCS) by basing four in Singapore. It called for a US–Vietnamese strategic partnership and conducted joint naval training with its former enemy. It even strengthened defence cooperation with Cambodia, which was thought to be in the ‘China camp’. Moreover, the US strengthened its posture in Japan and South Korea. Finally, the Pentagon pushed a new ‘AirSea Battle’ doctrine designed to counter a growing ‘anti-access/area-denial challenge’ in the Western Pacific, for which read: Chinese military systems. However, despite the impressive start the pivot faces at least three significant challenges. The first is strategy. The attention of the ‘rebalance’ has been on the military dimension of America’s Asia–Pacific engagement; notwithstanding that it also has a strong economic dimension, as evident in the Trans-Pacific Partnership (TPP) initiative. It will be important to come up with an overarching strategic framework for US policy in the Asia–Pacific to avoid the common misperception that the pivot has but one purpose—the containment of China. Of course, the rebalance was meant as a signal towards China that it had to play by some rules, but it was not the beginning of a ‘containment’ strategy against Beijing (as Chinese and some Western analysts claimed ). Containment, a comprehensive approach to obstruct China’s political, diplomatic, economic, and economic rise in Asia, is neither feasible nor reflective of US defence policy, which is much more nuanced than many commentators are prepared to acknowledge. Yet the central question of how to integrate China into a new Asia–Pacific security order remains largely unresolved. Failure to situate the rebalance in a broader US grand strategic approach could undermine its credibility as an instrument to promote regional stability. A growing number of analysts have thus criticised the absence of a declaratory US grand strategy  for the Asia–Pacific region—while Peter Layton previously wrote in The Strategist that, ironically, it is China that has the clearest grand strategic vision . The second challenge is alliance burden-sharing. As a new publication of the National Bureau for Asian Research  (including an ASPI contribution) makes clear, not all allies see eye-to-eye when it comes to the pivot. Japan and the Philippines seem most supportive, which is unsurprising given their ongoing territorial disputes with China. Thailand is the most reluctant given its growing domestic turmoil and economic dependence on China, raising broader questions about its continued reliability as a US ally. South Korea appears to be ambivalent, fearing a declining American focus on the North Korean threat. And Australia has rhetorically embraced the pivot but now rather sits on the fence when it comes to real investment in further underpinning the alliance. The next stage of the rebalance therefore requires substantial debate between the allies about mutual expectations in order to coordinate their respective defence strategies. What operational role is the ADF prepared to assume in an AirSea Battle framework—are we willing to implement a naval blockade, for example? In this context, Australia and its allies should continue to encourage Washington to clarify the operational requirements of the AirSea Battle concept to make it easier to gauge their potential military contributions and assess the strategic implications of signing off on the concept. Allies need to avoid the impression in Washington that the rhetorical embrace of the rebalance was not just a political manoeuvre for continued ‘free riding.’ In times of shrinking financial resources, the US expects its allies to do more for their own defence  (video), in addition to lending political support and providing access to US troops. That is why the Obama administration was bewildered when the Gillard government announced deep cuts in defence spending, throwing the future of the ADF’s power projection capabilities in disarray. The third challenge, of course, is Washington’s own budget. Can it actually afford to buy all the new military stuff needed to underwrite the rebalance, such as new ships, submarines, and aircraft? Certainly, the current level of US defence spending is unsustainable. But it’s also not necessary given the vast qualitative gap between the US and its potential ‘peer competitors’. Provided that the US systematically prioritises capabilities required for the Asia–Pacific theatre, China’s military will be a long way from significantly challenging the military balance of power in the Western Pacific. However, perception matters in international politics and Washington needs to avoid the impression that the pivot is built on the sand of a declining power. Otherwise, China and states in the region might well assume that the ‘balance of interests’ (as opposed to a material ‘balance of power’) is gradually tilting in Beijing’s favour. The Obama administration and Congress thus need to underwrite the rebalance by a sound acquisition strategy in this time of financial austerity. As the pivot enters into its next stage, Washington and its allies need to make sure that they don’t take their eyes off the ball. Luckily, Obama’s second term has just started. Benjamin Schreer is a senior analyst at the Australian Strategic Policy Institute. Image courtesy of Flickr user Julia Gillard .